This trail is the longest hiking trail in the Garden. It is 3.4 km long and will take approximately 2 to 3 hrs to complete. The trail commences with a steep hike up a kloof (ravine). It takes one through the Robertson Karoo area and onto the higher areas of the Breede Shale Renosterveld. The trail meanders near the eastern boundary of the Garden and ends at the Shale Trail. At the top of Beacon Hill, the highest point in the Garden – 526 m, one has an awesome view over the surrounding Breede River Valley. The renosterveld is a shrubland that resembles fynbos, but grows on more fertile, fine textured, clayish soils. It differs from true fynbos as it lacks proteoids (protea-like plants). One can clearly see the different vegetation types on the southern and northern slopes. The north facing slopes are drier and much more exposed to the sun. 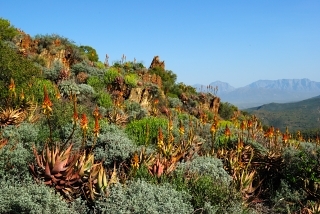 Plants that typically grow on this side are Aloe microstigma, euphorbias, mesembs and crassulas.The vegetation on the south facing slopes is taller, because the soil is deeper and moister. The south facing slopes show greater seasonal variation in terms of geophytes and annuals in winter and spring. In the northern hemisphere the opposite occurs – the south facing slopes are hot and dry and north facing slopes are cooler and moister. On the trail one can notice circular patches in the vegetation that differ from the rest in height, texture, colour and species composition. These heuweltjies (little hills) are caused by the activity of termites (and mole rats to a lesser degree). Termites take dead plant material to their nests, creating a more fertile patch that has better water holding capacity. Most plants in the area are adapted to the dry conditions and do not prefer these heuweltjies. Some plants, however, are associated with these heuweltjies. They include the yellow milkbush, Euphorbia mauritanica, the grey aromatic Pteronia incana and Aloe microstigma. The trail can be started from the vygie/mesemb beds. Follow the poles with the white paint on them. The Grysbokkie Trail can also be started from the western side (Shale Trail). Please note that due to heavy rain received in November 2013 there is some damage to the trail, please contact the office to make sure that the route is open. Things to take with you on the hike: water; sunscreen; hat; hiking shoes and a long sleeved shirt to prevent sunburn in summer. Please keep to the paths at all times and take your litter with you, do not remove plants, seed or stones or discard cigarette butts into the surrounding bush.